Anomaly detection has been the main focus of many researchers’ due to its potential in detecting novel attacks. However, its adoption to real-world applications has been hampered due to system complexity as these systems require a substantial amount of testing, evaluation, and tuning prior to deployment. Running these systems over real labeled network traces with a comprehensive and extensive set of intrusions and abnormal behavior is the most idealistic methodology for testing and evaluation. This itself is a significant challenge, since the availability of datasets is extremely rare, because from one side, many such datasets are internal and cannot be shared due to privacy issues, and on the other hand the others are heavily anonymized and do not reflect current trends, or they lack certain statistical characteristics, so a perfect dataset is yet to exist. Thus, researchers must resort to datasets that are often suboptimal. As network behaviours and patterns change and intrusions evolve, it has very much become necessary to move away from static and one-time datasets towards more dynamically generated datasets, which not only reflect the traffic compositions and intrusions of that time, but are also modifiable, extensible, and reproducible. To overcome these shortcomings, a systematic approach has been devised to generate datasets to analyze, test, and evaluate intrusion detection systems, with a focus towards network-based anomaly detectors. The main objective of this project is to develop a systematic approach to generate diverse and comprehensive benchmark dataset for intrusion detection based on the creation of user profiles which contain abstract representations of events and behaviours seen on the network. The profiles will be combined to generate a diverse set of datasets each with a unique set of features, which covers a portion of the evaluation domain. The final dataset includes seven different attack scenarios: Brute-force, Heartbleed, Botnet, DoS, DDoS, Web attacks, and infiltration of the network from inside. The attacking infrastructure includes 50 machines and the victim organization has 5 departments and includes 420 machines and 30 servers. The dataset includes the captures network traffic and system logs of each machine, along with 80 features extracted from the captured traffic using CICFlowMeter-V3. B-profiles: Encapsulate the entity behaviours of users using various machine learning and statistical analysis techniques (such as K-Means, Random Forest, SVM, and J48). The encapsulated features are distributions of packet sizes of a protocol, number of packets per flow, certain patterns in the payload, size of payload, and request time distribution of a protocol. The following protocols will be simulated in our testbed environment: HTTPS, HTTP, SMTP, POP3, IMAP, SSH, and FTP. Based on our initial observations majority of traffic is HTTP and HTTPS. Infiltration of the network from inside: Infiltration of the network from inside: In this scenario, we send a malicious file via an email to the victim and exploit an application vulnerability. After successful exploitation, a backdoor will be executed on the victim’s computer and then we use his computer to scan the internal network for other vulnerable boxes and exploit them if possible. HTTP denial of service: HTTP denial of service: In this scenario, we utilize Slowloris and LOIC as our main tools, which have been proven to make Web servers completely inaccessible using a single attacking machine. Slowloris starts by making a full TCP connection to the remote server. The tool holds the connection open by sending valid, incomplete HTTP requests to the server at regular intervals to keep the sockets from closing. Since any Web server has a finite ability to serve connections, it will only be a matter of time before all sockets are used up and no other connection can be made. Also, HOIC is another famous application which can launch DoS attacks against websites. Collection of web application attacks: Collection of web application attacks: In this scenario, we use Damn Vulnerable Web App (DVWA), which is developed to be an aid for security professionals to test their skills, as our victim web application. In the first step, we scan the website through a web application vulnerability scanner and then we conduct different types of web attacks on the vulnerable website, including SQL injection, command injection, and unrestricted file upload. Brute force attacks: Brute force attacks: Brute force attacks are very common against networks as they tend to break into accounts with weak username and password combinations. The final scenario has been designed with the goal of acquiring an SSH and MySQL account by running a dictionary brute force attack against the main server. Last updated attacks: Last updated attacks: There are some attacks based on some famous vulnerabilities that can be conducted during a specific amount of time (these are extraordinary vulnerabilities which sometimes affects millions of servers or victims, and normally it takes months to patch all vulnerable computers around the world), one of the most famous ones in recent years is Heartbleed. It is important to note that a profile needs an infrastructure to be used effectively. Our testbed will consist of some interconnected Windows and Linux based workstations. For Windows machines, we will use different service packs (because each pack has a diverse set of known vulnerabilities) and for Linux machines we will use Metasploit-able distribution, which is developed for being attacked by the new penetration testers. To produce benign background traffic, B-Profile is designed to extract the abstract behaviour of a group of human users. It tries to encapsulate network events produced by users with machine learning and statistical analysis techniques. The encapsulated features are distributions of packet sizes of a protocol, number of packets per flow, certain patterns in the payload, size of payload, and request time distribution of protocols. Once B-Profiles are derived from users, an agent (CIC-BenignGenerator) or a human operator can use them to generate realistic benign events on the network. Organizations and researchers can use this approach to easily generate realistic datasets; therefore, there is no need to anonymize datasets. We have implemented seven attack scenarios. For each attack, we define a scenario based on the implemented network topology and execute the attack from one or more machines outside the target network. Figure 1 shows the implemented network which is a common LAN network topology on the AWS computing platform. 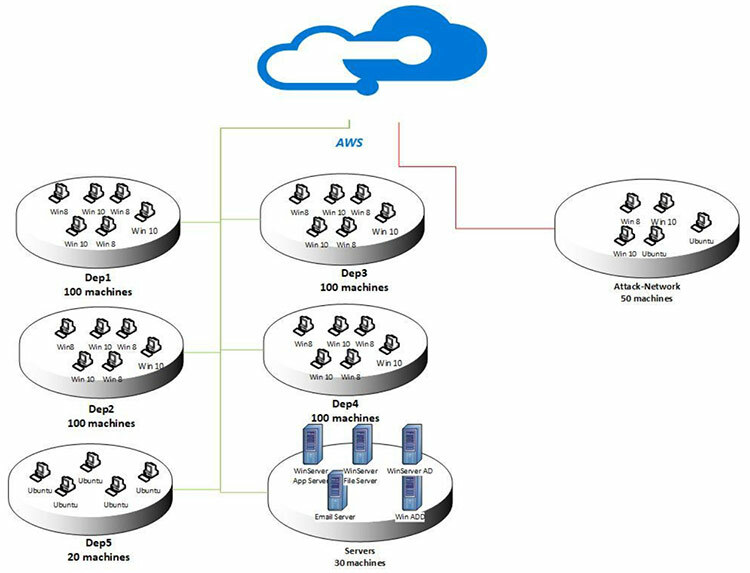 To have a diversity of machines similar to real-world networks, we have installed 5 subnets, namely R&D department (Dep1), Management Department (Dep2), Technician department (Dep3), Secretary and operation department (Dep4), IT department (Dep5), and server rooms. For all departments except the IT department we have installed sets of different MS Windows OSs (Windows 8.1 and Windows 10) and all computers in the IT department are Ubuntu. For the server room, we implemented, different MS Windows servers such as 2012 and 2016. The rest of this section presents the seven attacks scenarios and tools. There are many tools for conducting brute-force attacks and password cracking such as Hydra, Medusa, Ncrack, Metasploit modules, and Nmap NSE scripts. Also, there are some tools such as hashcat and hashpump for password hash cracking. But one of the most comprehensive multi-threaded tools is Patator, which is written in Python and seems to be more reliable and flexible than others. It can also save every response in a separate log file for later review. In this dataset we use two modules, FTP and SSH on the Kali Linux machine as the attacker machine and an Ubuntu 14.0 system as the victim machine. For a list of passwords, we use a large dictionary that contains 90 million words. To exploit the vulnerability, we compiled OpenSSL version 1.0.1f, which is a vulnerable version. Then we use Heartleech to retrieve the memory of the server. In this scenario, we infect machines with two different botnets (Zeus and Ares), also every 400 seconds we request screenshots from the zombies. Slowloris is a type of denial of service attack tool invented by Robert Hansen which allows a single machine to take down another machine's web server with minimal bandwidth and side effects on unrelated services and ports. In this scenario, we use a Slowloris Perl-based tool to take down the web server. The High Orbit Ion Cannon, often abbreviated to HOIC, is an open source network stress testing and denial-of-service attack application written in BASIC designed to attack as many as 256 URLs at the same time. It has been designed to replace the Low Orbit Ion Cannon which was developed by Praetox Technologies. In this scenario, we use free HOIC tool to conduct DDoS attack by using 4 different computers. In this work, we use Damn Vulnerable Web App (DVWA) to conduct our attacks. DVWA is a PHP/MySQL web application that is vulnerable. Its main goals are to be an aid for security professionals to test their skills and tools in a legal environment, help web developers better understand the processes of securing web applications and aid teachers/students to teach/learn web application security in a class room environment. To automate the attacks in XSS and Brute-force section we developed an automation code with Selenium framework. In this scenario, a vulnerable application (such as Adobe Acrobat Reader 9) should be exploited. First the victim receives a malicious document through the email. Then, after successful exploitation using Metasploit framework, a backdoor will be executed on the victim’s computer. Now we can conduct different attacks on the victim’s network include IP sweep, full port scan and service enumerations using Nmap. Based on all selected attacks and defined scenarios in previous section, we implemented the infrastructure and execute the attack scenarios. Table 2 shows, the list of attacks, related attackers and victims IP(s), Date, start and finish time of attack(s). CICFlowMeter is a network traffic flow generator which has been written in Java and offers more flexibility in terms of choosing the features you want to calculate, adding new ones, and having a better control of the duration of the flow timeout. It generates Bidirectional Flows (Biflow), where the first packet determines the forward (source to destination) and backward (destination to source) directions, hence the 83 statistical features such as Duration, Number of packets, Number of bytes, Length of packets, etc. are also calculated separately in the forward and reverse direction. After extracting the features and creating the CSV file, now we need to label the data. Here we used our attack scenarios schedule and the IPs and ports of the source and destination along with the protocol name to label the data per flow. The dataset has been organized per day. For each day, we recorded the raw data including the network traffic (Pcaps) and event logs (windows and Ubuntu event Logs) per machine. In features extraction process from the raw data, we used the CICFlowMeter-V3 and extracted more than 80 traffic features and saved them as a CSV file per machine. If you want to use the AI techniques to analyze, you can download our generated data (CSV) files and analyze the network traffic. If you want to use a new feature extractor, you can use the raw captured files (PCAP and Logs) to extract your features. And then, you can use the data mining techniques for analyzing the generated data. You may redistribute, republish, and mirror the CSE-CIC-IDS2018 dataset in any form. However, any use or redistribution of the data must include a citation to the CSE-CIC-IDS2018 dataset and a link to this page in AWS.